Through the eyes of a child #1, originally uploaded by jahansell. On Sunday morning, my five year old daughter woke up before anyone else. She'd come down with a case of strep throat the day before (yes, the day of my triathlon and her sister's ballet concert, for anyone that's keeping score!) and had made her way into my bed around dawn. She couldn't breathe comfortably through her nose so was dozing fitfully, keeping me awake too. I decided to get up and tiptoe downstairs, thinking I'd slip out for a bit of early morning picture taking, but she wanted to come too. So I handed her my little Canon point and shoot, showed her how to zoom, and off we went - she still in her nightgown and little pink slippers. We visited Mudge Pond, drove around downtown, and took a few turns I'd never tried before. Her pictures don't always stick to traditional rules (like keeping the horizon line horizontal!) 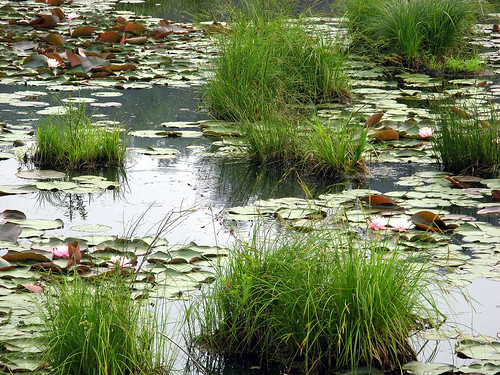 but they always show something worth looking at, like this shot of a little pond full of tufts and lily pads. The bullfrogs and red-winged blackbirds here were deafening! I think I'll post a few more of her photos in the next few days. There are rules!! !..oops..didn't know that I just click and hope! Great photo by your daughter...can see she's inherited her Mum's talent. That is a nice shot. I was also interested in the frogs and birds you mentioned. Nice shot. No telling where she'll be in this photo blog world in a few years! Very nice photo. My daughter sent me the link to this blog after visiting here herself. I didn't expect to find a neighbor from up the road in Sharon, CT.
Perhaps in two years my grandson will be shooting. I hope he does as well. Great shot! Great compostion! Great Photographer! This is totally fantastic photo! Well done! Wow, now I see, it's your little daughter whos has taken the photo. Unbelievable. She's got 'the eye'. She seems to have a great talent in seeing motifs. What photos will she take when she is older?